Tea writer and expert, Georgia, author of Notes on Tea, took some time to answer our questions about blogging, food, and what tea you might have overlooked. Please enjoy, we certainly did. How did your journey with tea begin? My tea journey began with “tea” I now know is not derived from Camellia sinensis. Growing up, many ailments were resolved with hot herbal infusions, aka tisanes. I didn’t drink much real tea until I lived in Boston, MA where one of my dear friends and I would hang out at local tea shops and treat ourselves to hotel afternoon tea. When I moved to Berkeley, CA, I was introduced to unblended loose-leaf tea, gaiwans, and gongfu cha. Notes on Tea was born in Berkeley. I fondly recall drinking tea with friends at Teance, Imperial Tea Court, and Far Leaves Tea. My husband likes to tease that I used to drink coffee at midnight when we first met. I enjoy the occasional cup of cappuccino but I’m so glad I’m a tea head. I read you grew up in the Caribbean. Do you still live there now? How has that shaped your palate for food and tea? My family emigrated to the U.S. in the late 1980s. Sadly, I have not spent much time in the Caribbean since then. However, the cuisine I ate during my childhood has influenced my adult food preferences. I grew up eating picked-from-the-tree fresh fruit. I look forward to summer in the U.S. when seasonal fruit is flavorful and abundant. In addition to a diverse fruit basket, I was exposed to many different kinds of vegetables. Food was cooked with lots of spices—warm spices like ginger as well as hot spices like Scotch bonnet, a type of chili pepper. I still very much enjoy spiced foods. The national motto of Jamaica is “out of many one people.” Jamaican cuisine has many influences—African, Indian, Chinese, Spanish, British, and more. I attribute my love of diverse foods to my background. Chocolate and cheese are my favorite foods to pair with tea! One of my first tea experiences in NYC was a tea and cheese pairing hosted by In Pursuit of Tea when the company had a pop-up on Crosby Street. A couple of years ago, my “tea amigos” and I wrote about pairing white tea and (French) cheese. I haven’t had any formal tea and chocolate pairings, unfortunately. That’s something I should look to add to my tea experiences. One of my favorite casual tea and chocolate pairings is a matcha white chocolate bark. The recipe is a modified version of Gretha Scholtz’s Superfood Matcha White Chocolate Bark. I’m sure you saw this coming, but tell me about your favorite tea(s). It depends on the time of day and the season. I prefer to start my day with a black tea throughout the year. I look for a strong black tea with malty and dark fruit notes. During the winter, I tend to drink dark oolong and sheng puerh. As the weather warms, I transition to green oolong and Japanese green tea. If I had to choose a favorite tea category, it would be Taiwanese oolong. You could say that I always have a cup of tea at hand though that’s been less true this year. I have at least one “Western cup” of tea each day. The optimal amount of tea per day would be that cup of black tea for breakfast followed by a gongfu preparation mid-morning through lunch. I tend not to drink tea after 3-4 p.m. because caffeine negatively affects my sleep. Ideally I would start a new gongfu session in the early afternoon and complete it the following day. Assuming you have a plethora of tea from reviews etc., how do you organize your tea? Do you have a tea cabinet? I have a shelf for occasional use tea ware and empty tea tins. I have a full cupboard devoted to additional occasional use tea ware, everyday tea ware, and already reviewed and personal teas. On my countertop, there used to be a bin with teas to be reviewed, ordered chronologically by date of receipt. I am proud to say that I have been devoted to drinking more of my personal teas, so I can now store teas to be reviewed in a cupboard, not on the counter. Also on the counter is a tea tray with my side-handled teapots. 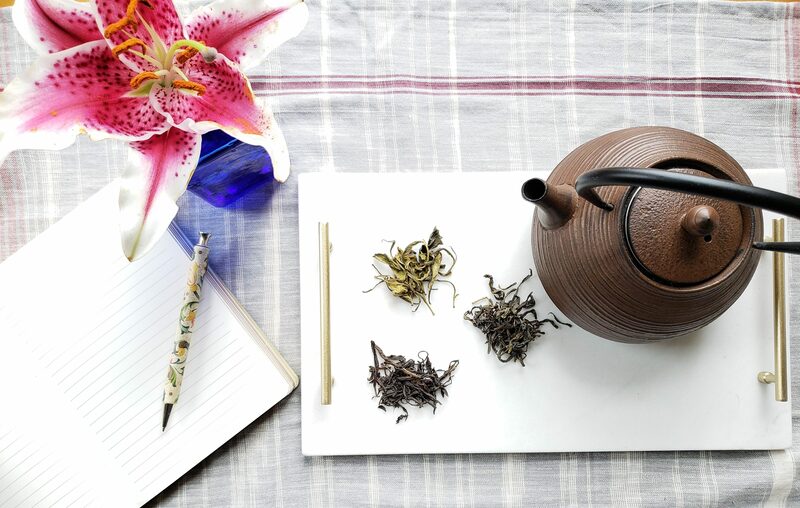 As a tea writer, blogger, reviewer, expert… what tea do you feel is overlooked? What are people not talking about that’s maybe worth some spotlight? This is a great question! One aspect of the tea industry I’d like to spotlight is tea production in North America. I started a series on the blog titled “United States of Tea” and have featured Mauna Kea Tea on Hawaii and Minto Island Tea Company in Oregon. After completing Jane Pettigrew’s latest book, World of Tea, I have a better sense of the geography of tea production in North America. It’s fascinating to learn about how folks in this part of the world are applying traditional tea farming and production methods as well as innovating new methods that suit their bioregion. Another topic of interest is women in tea. Many of the tea bloggers and writers I read are women. Many of the owners of teashops in my neighborhood and broadly citywide are women. I’m also seeing women in tea sommelier positions. Not to mention the many women who harvest tea especially in Asian and African tea producing countries. Women are integral to tea and I’d like to see a thoughtful “women in tea” campaign which could include film, conference, and other components. What’s your favorite type of post to write? What are your favorite parts of tea/tea culture to write about? Comparing two or more teas is my favorite type of post. The way I structure these posts is a reflection of the sci-nerd part of me. I approach comparative tastings almost as a science experiment. I like to think about measurements, vessels, the sequence of steps as well as the order in which I will visually assess and taste the teas. Another type of post that is fast becoming a favorite is the “how to” guides I’ve been experimenting with in recent months. Have you ever received a tea for review and didn’t like it? How did you handle that? I have experienced this many times. If the tea is of poor quality, I don’t publish a review. If it’s a matter of the tea not suiting my palette, I will post a review indicating that the tea might suit the reader if they like characteristics x, y, z. I also indicate alternate ways to prepare the tea to potentially enhance the tasting experience. Would you ever consider turning your blog into a book? Seriously, I have a few books ideas related to tea. One would be a collection of stories about the favorite teaware of people in the industry (authors, bloggers, producers, etc.) prefaced by a history of teaware. In fact, there’s a series on the blog titled Favorite Tea Ware. A second idea is a collection of tea scenes featured in children’s books. I used to publish these on the blog then switched to featuring them on Twitter and Instagram. I am delighted when I discover illustrations of tea in the picture books I read to my children. The third idea is botanically oriented. I’d love to explore the other plants that grow alongside tea, whether purposefully planted/maintained or the ones those spontaneously grow among tea. Related is to figure out the bird life in tea gardens. Here I need to give a shout out to Bryony Angell, writer and self-proclaimed “urban girl birder,” who asked me about bird-friendly tea production. When you’re not writing Notes On Tea, what do you do? I like to say that I am part of the gig economy. I wear a few hats outside of tea blogging. I have been teaching a literacy and crafts afterschool program for a couple of years. In the spring through fall seasons, I partner with a nonprofit organization to host a pop-up bird education program in parks and other public spaces in NYC. Relatedly, I co-direct an ecology project in a historic neighborhood park also in NYC. Lately I have been writing articles on a freelance basis for Audubon.com and Audubon magazine.